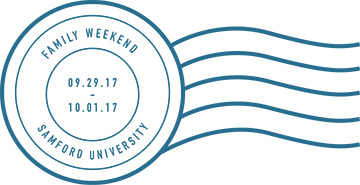 Registration is open for Samford University’s annual Family Weekend, scheduled for Sept. 29–Oct. 1. Doyle urged families to register in advance since many activities have limited space available. Some events also require advance ticket purchases. The schedule includes several traditional events, including a reception Friday afternoon hosted by Samford President Andrew Westmoreland and his wife, Jeanna, a prayer walk Saturday morning followed by the Samford Parents Association breakfast, and tailgating before the afternoon football game against Southern Conference foe The Citadel. The weekend concludes with the annual Samford Hymn Sing Sunday afternoon. Parent Academy Friday afternoon will include several classes taught by Samford faculty. This opportunity has become one of the most popular events of Family Weekend, Doyle noted. Two one-hour sessions are scheduled, and parents may choose a course during either or both sessions. Each of Samford’s 10 academic schools is offering a session, and topics range from estate and retirement planning to health care and the Reformation. One session also will provide an overview of the Cultural Perspectives course that is part of the required core curriculum for all students. Parent Academy classes are designed for parents only, with the exception of the two classes offered in Christenberry Planetarium that school-aged children may attend. Other special events during the weekend include a choral vespers service on Friday evening, several performances of How I Became a Pirate by Samford Theatre, Saturday morning open houses across campus and a Friday evening soccer match against SoCon rival Chattanooga. Brock School of Business also will have its annual Rite of Passage ceremony Friday afternoon. While Parent Academy is in session, Doyle said siblings may request a 1 p.m. tour through the Samford admission office, visit their Samford sibling, attend the two classes offered in the planetarium, or pick up a copy of the Tiny Sam Photo Scavenger Hunt at registration and begin sleuthing on the quad. The first person to complete the scavenger hunt accurately wins a Step Sing weekend package including four Step Sing tickets to the performance of choice, a two-night stay at Birmingham’s Ross Bridge resort and dinner for four at Little Donkey restaurant. The winner will be announced and awarded during the football game. “Our hope is that Samford families enjoy taking advantage of attending classes, gathering for breakfast, tailgating on the quad and cheering the Bulldogs as they meet The Citadel on Saturday,” Doyle added.